We were very worried earlier this week to hear than our Most Avid Blog Reader, James’s wonderful Grandad Ken, was rushed into hospital for emergency surgery. It was touch and go, but thankfully he is now recovering, and was reported to have asked for seconds of ice cream, which is surely a good sign! Wishing you a swift recovery Ken, we’re thinking of you! Here he is steering Lucky Duck in Reading when we first bought it. I was wondering the other day, about when was the exact moment I was bitten by the “old boat” bug? 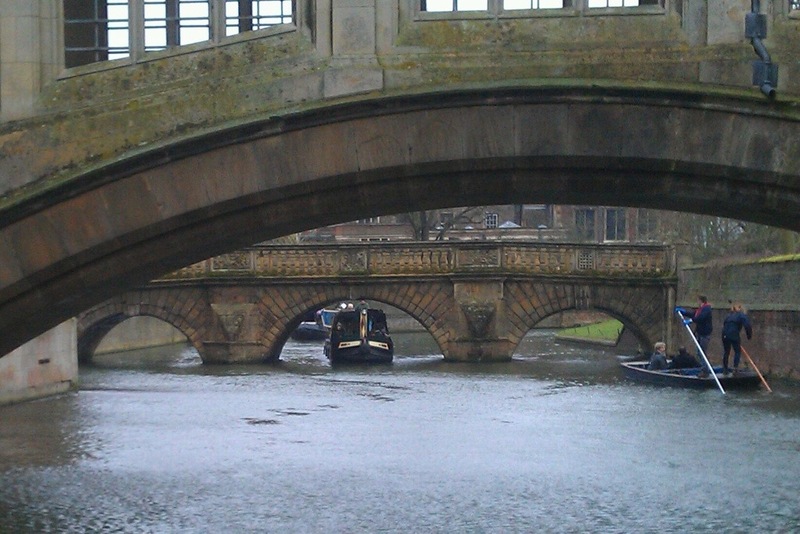 Undoubtedly I’d seen the two historic narrow boats Roe and Speck which were moored in Cambridge when James and I first got together and spent time with our friends on the river. But I don’t have any particularly abiding memories of seeing either of those and getting excited by them. Perhaps I didn’t even notice that they were different? Josher steamer President taken from the exact spot where Willow is now moored. I was smitten. 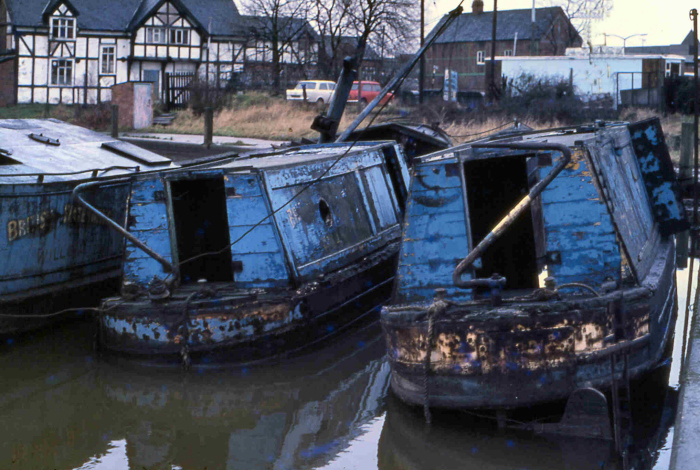 The romance and traditions of the historic narrow boats built to carry cargo on the canals captivated me, and by co-incidence five years later we ended up buying one of the boats which was abandoned in Northwich at the same time as President. 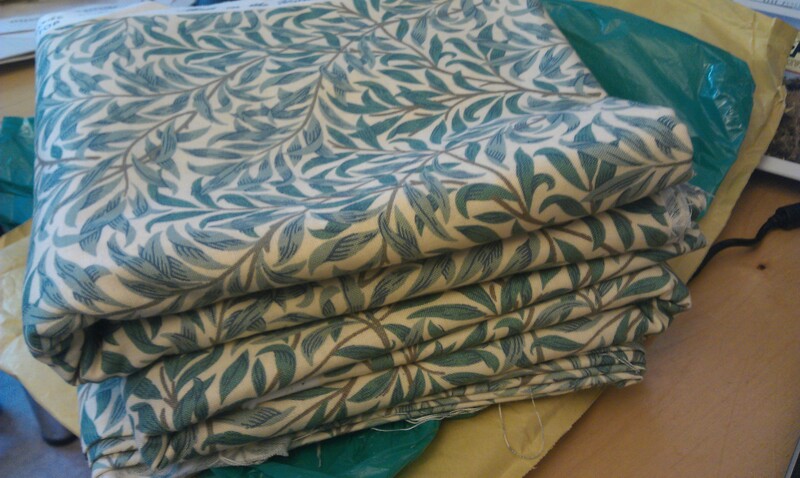 My next project is to turn this pile of fabric into new curtains for Willow. The existing ones are serviceable but I’ve always wanted to replace them with curtains made from William Morris’s “Willow Bough” fabric. It took me a while to find enough of it for a reasonable price on ebay (I couldn’t buy at the standard prices I’d found in fabric shops – upwards of £30/m). Last year I serviced my Singer sewing machine and so now’s my chance to put it to use! I plan to re use the header tape from the existing ones and use them as a pattern then I will update once I’ve made some progress! Happy New Year to you all, I hope you had a wonderful Christmas and New Year. How many times does something have to have happened for it to become a “tradition”? Twice in this case! 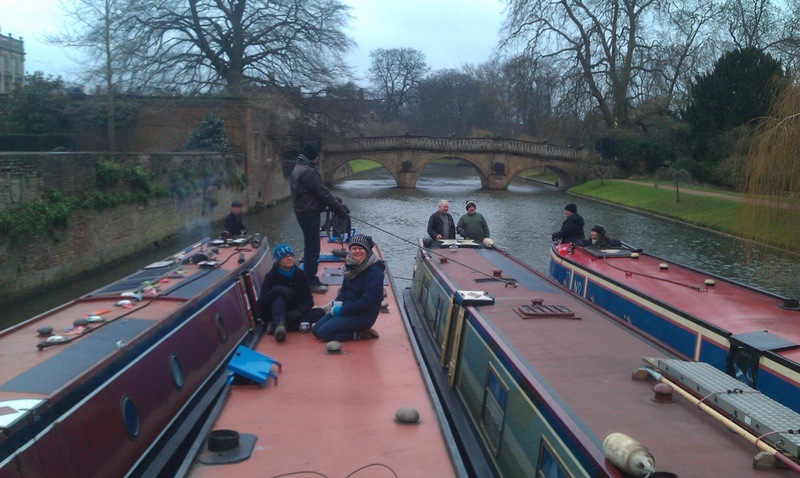 Last year we went for a new year’s Backs cruise, to test whether or not Willow would be able to turn at the Mill Pond, as we thought it would be a quiet day. 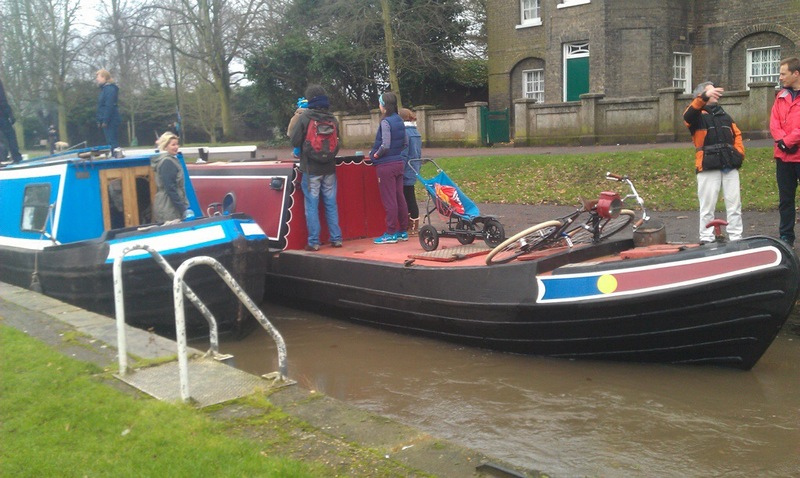 Our friend Ally brought her boat Charity along too. A local photographer happened to be out taking pictures, and he snapped a few photos which ended up as a small piece in the Times, and somehow he’d got the idea that we were *only* allowed to go that way on New Years’s day. He got in touch with Ally and asked if we were doing it again this year. 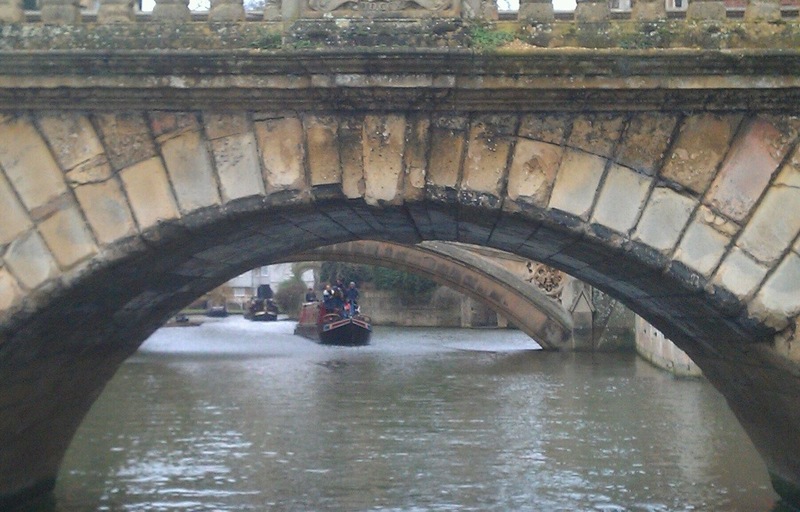 We decided to live up to this long established tradition and this time, two more boats joined us – Pyxis and Eleanor. It was a great way to start the year, and I hope the tradition will continue. 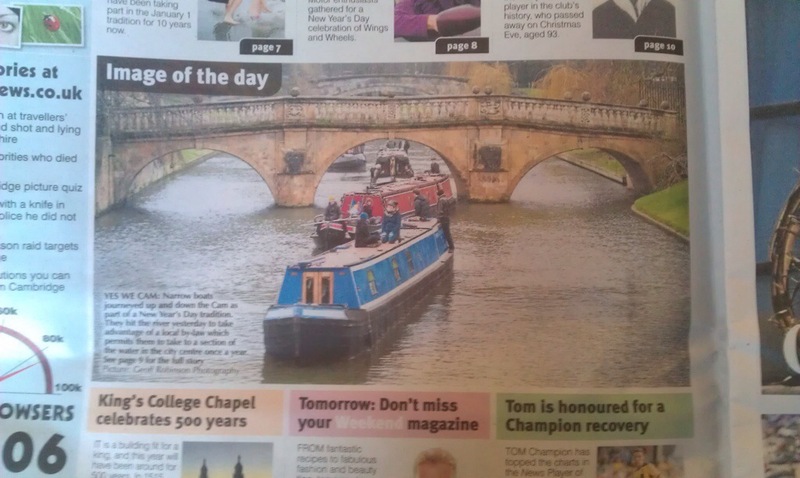 We didn’t make the Times this year but we did feature in the Cambridge News!